Last week Boston Mayor Thomas Menino announced his desire to see a 1000 foot tower built on the site of the Winthrop Square parking garage. I have a number of thoughts on this subject which I am currently writing up, but I thought my readers might like to see the location of some other notable tall buildings in Boston relative to the Winthrop Square site. I've modified one of my favorite Boston maps (it dates to the late 19th century) to show the site of the (1) proposed tower site, (2) the location of the Ames Building, which was the tallest building in Boston when it was built in the 1893, (3) the Custom House, which, when its tower was added in 1915 became the tallest building in Boston at 496 feet, and (4) one of the newest tall buildings on the Boston skyline, One Lincoln Street, which is 503 feet tall and was completed in 2003. In addition, on the map you can see some other information: the orange sections are the original land mass of Boston, the greenish areas are swamp and marsh, and the graded lines show hills. 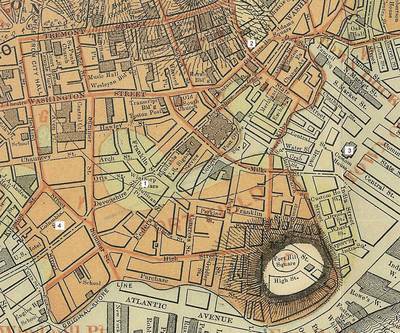 Everything else is water: the site of Faneuil Hall and Quincy Market, Atlantic Avenue, etc. I will be adding more buildings and sites to this map in coming weeks.